The most extravagant carpet ever made in the history of mankind, described by Sir George Birdwood, a connoisseur of Indian jewelry, in 1879 as “The Most Wonderful Piece of Embroidery ever known,” the Pearl Carpet of Baroda, gets its name from the Maratha Princely State of Baroda, one of the four Princely States of the Maratha Confederacy, that was ruled by the Gaekwar dynasty since 1740. The Maharajah Gaekwar of Baroda Khande Rao who ruled between 1856 and 1870, was one of the most notable connoisseurs and collectors of jewels and jewelry in the history of the entire dynasty, who would have gone to any extent, despite the expenditure involved, to acquire any jewel that captured his interest in any part of the world, or create any fabulous piece of jewelry that took shape in his fertile mind, using the most highly skilled and experienced jewelry craftsmen, who had been trained in the Mughal tradition of jewelry crafting, who were at the disposal of his court. The Pearl Carpet of Baroda was one such creation commissioned by Geakwar Khande Rao, in 1860 and completed in 1865, that was meant to fulfill a vow he had made, to cover the tomb of the Holy Prophet of Islam, Prophet Muhammad, at Medinat-ul-Munawwara, the hallowed sanctuary, revered by Muslims all over the world. Gaekwar Khande Rao was a Hindu ruler, but was fascinated by Islam and its teachings, and ordered the carpets not only to fulfill a vow, but also to show his respect and admiration for Islam, a religion followed by a considerable number of his subjects. Covering the tombs of saints with expensive materials is a tradition prevalent among Indian Muslims to this day, and usually carried out in fulfillment of vows after their prayers have been answered. 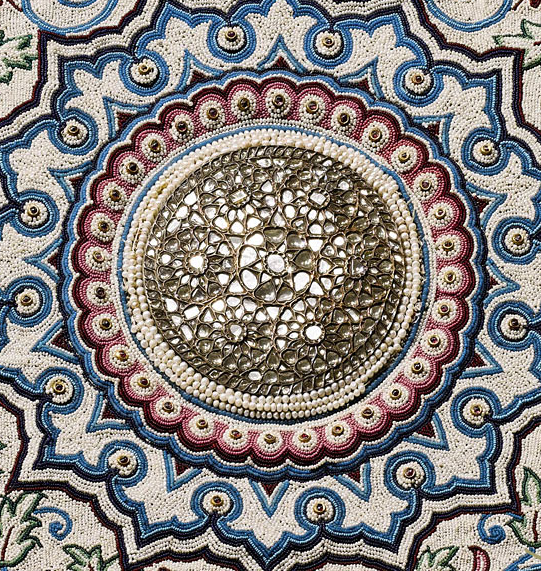 The carpet was referred to as a “Pearl Carpet,” mainly because the dominant gems that were set in the carpet were seed pearls, over one million of them, even though there were other larger and more expensive gems incorporated such as diamonds, rubies, emeralds and sapphires. Khande Rao Gaekwar a great connoisseur and collector of jewels and jewelry in the 19th century. Out of the 13 Gaekwad Maharajahs of Baroda the one that became most well known for his lavish spending and extravagant tastes was Khande Rao Gaekwar, who ruled between 1856 and 1870. He was one of the greatest collectors and connoisseurs of jewels and jewelry in the 19th century. One of his remarkable acquisitions was the 128.48-carat “Star of the South Diamond,” the first Brazilian diamond to acquire international fame due to its extraordinary quality and was purchased by Khande Rao Gaekwar for £80,000 in 1867. The Prince was so enthused with this purchase, that he staged a massive celebration to welcome the “Star of the South Diamond” to India, that included a parade of his elephants adorned in their finest gilded arrays. Subsequently the Maharajah also purchased the 76.5-carat drop-shaped “English Dresden Diamond” and eventually got both stones incorporated as the centerpiece of a triple-tiered diamond necklace, that came to be known as the “Baroda Diamond Necklace.” Other extravagant pieces of jewelry designed during the period of Khande Rao Gaekwar included the seven-stranded diamond and emerald necklace known as the “Hindu Necklace,” and the legendary seven-stranded natural pearl necklace, which came to be known as the “Baroda Pearl Necklace,” two of the most expensive pieces of jewelry owned by him. He is also reported to have purchased several pieces of jewelry that once belonged to Empress Eugenie, empress consort of Napoleon III. 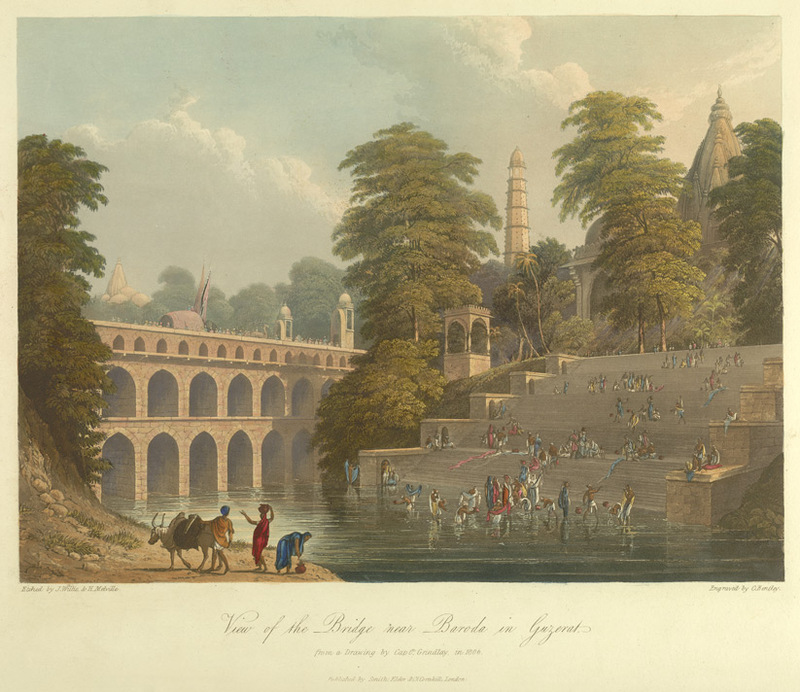 The chronological sequence of his lavish purchases, seem to suggest that the “Pearl Carpet” was one of his first extravagant acquisitions which he commissioned in 1960, just 4 years after his ascension to the throne of Baroda, and took five years to complete, with over a hundred of his court artisans actively involved in the project. 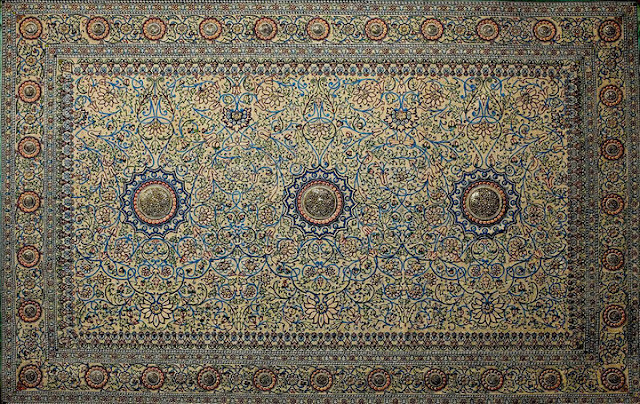 The primary aim in executing this lavish carpet according to authentic sources, was to fulfill a vow which Khande Rao Gaekwar had taken to cover the tomb of the Prophet of Islam, in Medina, probably as a reciprocation for prayers answered or as a mark of respect and admiration for Islam, a religion followed by a size-able population of his domain. Some writers even suggest that the extravagancy of the carpet produced seem not only to show his fascination and respect for the religion of Islam, but also his inherent inclination towards it, even though he was not able to express it outwardly being a Hindu Maharajah of a predominantly Hindu State. However, the fact that the carpet was commissioned just 4 years after his ascension to the throne, seem to indicate that the first reason adduced, viz. the fulfillment of a vow, is the more plausible explanation. When the auction got underway on March 19, 2009, there were only three bidders for the carpet, and therefore the starting price was brought down to $4.5 million. An anonymous buyer who bid by telephone eventually bought the Baroda Pearl Carpet for $5.5 million, setting a new record for a carpet sold at an auction. The previous record for a carpet sold at an auction, was created in June 2008, when a 400-year old Persian Isfahan Carpet, was auctioned by Christie’s in New York for $4.45 million. The fact that there were only three bidders for the carpet, which fetched only $5.5 million, far short of the pre-sale estimate of 20 million dollars, was a reflection of the falling demand for such collectors items in the face of the current world recession. The identity and nationality of the seller and the buyer were not disclosed by the auction house.